Guest posting can be a great asset to your blog or business, but there are several guest posting mistakes you may not be aware that you're making that can hurt you in the long run. Many guest posters make these mistakes unknowingly and then wonder why their post is not published, they're not asked to guest again, or they don't receive the desired traffic from the post. If the host blog or website has guest posting guidelines, read them. Read them before approaching the host so that you know what they expect and can be prepared to give them your best work according to their expectations. It is very frustrating to work with someone who doesn't follow instructions. Even when you think you're sure you know what is expected, read back through the guidelines again before submitting, to be sure you haven't overlooked anything. At the very least abide by them, at best go above and beyond what is asked. Whatever your personal motive for guest posting, you will be more successful when you write to help or inform the host's audience. When you can solve their problems, or give new information to their situation, you will automatically be seen as an expert without having to try to “show off”. Just be you, and aim to serve them. Not including an author bio, or writing it in the first person is the telltale sign of an amateur. Anytime you guest post, include with the post submission a short bio written in the third person, and thumbnail photo of yourself. Think of it as the host introducing you to their audience, only you get to tell them what to say. Include your name (exactly as it is on all of your social platforms, for consistency and branding). Tell them where to find you and what you have to offer the reader. Don't include every one of your 30 social media links. Share one or two that you are targeting for growth or just include a link to your freebie to grow your list. 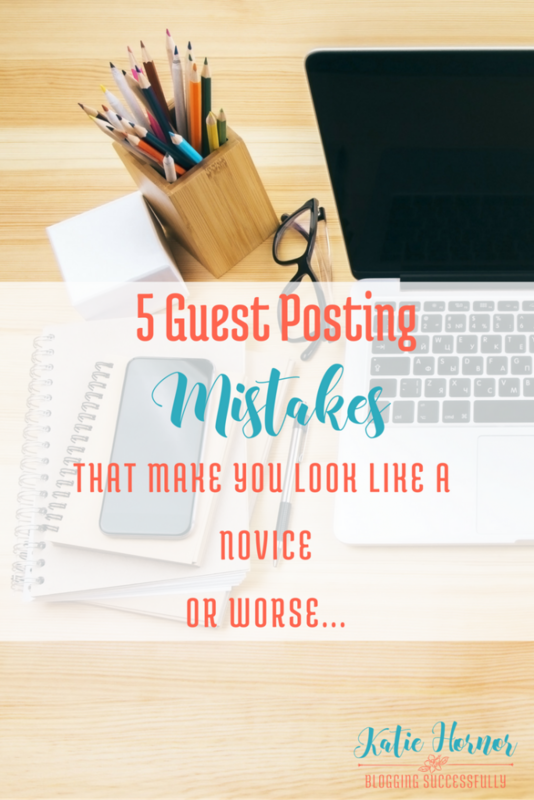 These are just a few of the guest posting mistakes that are made often, but easy to be avoided. If you'd like more information about how to be an awesome guest poster and have hosts begging you to guest again, click here to get my brand new ebook: The Blogger's Guide to Guest Posting! Great tips, thanks Katie! I have had mixed results with guest posting, so I’m thankful for a few tips to help increase my success! Glad you found it helpful, Virginia. I think the key is to be very helpful, very professional and very clear on your goals for guest posting.